Fig. 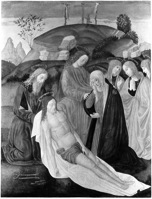 1 Alesso di Benozzo Gozzoli, The Deposition of Christ, c.1500, Philbrook Museum of Art, photo: Murray Keyes, 12/8/1937. The National Gallery of Art, and specifically the Library’s Department of Image Collections (DLI), has long enjoyed the generosity of Samuel H. Kress and his Foundation. This department’s photographic archive, now one of the largest art historical photo collections in the world, was established by the foundation in 1970 and of course, the Gallery itself was shaped by Kress’s seminal gifts, beginning in 1939. While the majority of his collection went to the National Gallery, Kress also donated European art to 90 institutions in 33 states, making art accessible to areas formerly without such cultural resources. After the dissemination of the collection (completed in 1961), the Kress Foundation continued to serve as a repository for many archival and photographic materials pertaining to the Kress Collection. In the 1970s and early 1980s, the Foundation donated its sizable holdings of photographs and negatives of the collection to DLI for preservation and reproduction, if needed. These negatives were made by various photographers between c.1910 and 1969 and represent objects from the Kress gift (not including the Dreyfus medals and bronzes). Among the photographers represented are Foto Reali, Murray Keyes (fig. 1), Alfred Martin, Siegfried Colten, Paul Kiehart (fig. 2), the NGA and Bullaty-Lomeo. They document the objects in various views and states of conservation and occasionally include infrared images and x-rays. For decades these materials have been consulted by art historians and have been an important resource for documentation of the physical history of these objects. Recently, the National Gallery became concerned that these 5,600 historic negatives of the Kress Collection were beginning to degrade so we began to explore option for scanning. In 2008, the department received a grant from the Samuel H. Kress Foundation to digitize and mount the images on the Image Collection’s website for public access. 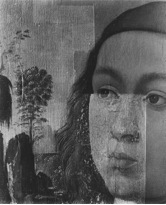 This Kress project complements the department’s 2000-2006 Foto Reali digitization project undertaken with the assistance of ARTstor. The Foto Reali glass negatives scanned by ARTstor include 612 Kress objects and the associated records served as a springboard for the Kress project. Fig. 2 Agnolo di Domenico del Mazziere, Portrait of a Youth, National Gallery of Art, photo: Paul Keihart, 4/1/1954. During the scanning, the size of the project grew with additional gifts to the department and continued reconsideration of the project’s scope. The NGA’s Department of Imaging and Visual Services transferred negatives of non-NGA objects to DLI which contained 49 negatives of Kress objects photographed by NGA photographer Henry Beville in 1944-1946; these negatives were added to the project. Similarly, the Kress Foundation facilitated the donation of 844 color lantern slides made in the 1940s, largely by Louis Werner, which had already been scanned by the Institute of Fine Arts. These images were also added to the project. In order to make the project as all-inclusive as possible, we decided to survey DLI’s extensive photographic archive for additional images not represented in the negatives. As a result, 1,800 new images were added. Among the many photographers represented by the photos are Alinari, Anderson, Brogi, A.C. Cooper, Villani and Archivo Mas. Also scanned were 217 oversized sepia-toned carbon prints by Vittorio Jacquier made in 1930 or 1931 (fig 3). Many of the Jacquier prints are annotated with opinions solicited by Kress from scholars in the 1930s such as Lionello Venturi, Roberto Longhi, Wilhelm Suida, and Giuseppe Fiocco. We scanned these and other signed opinions (including a few by Bernard Berenson) from the collection. The combination of the negatives, photographs, lantern slides and other related materials document the history of each object in ways not seen elsewhere. Fig. 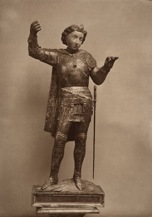 3 Italian (Veneto), 15th century, Saint Michael, c.1450, University of Arizona, Museum of Art, photo: Vittorio Jacquier, 1930/1. The DLI Kress Collection also includes photographs and negatives of some objects considered for purchase, but returned to the dealer (called “Off Inventory” in the Kress Foundation records). In many cases the date of purchase and return was found through the files of the Kress Foundation Archives in New York and the National Gallery Archives. Occasionally documentation also exists describing why the objects were not kept; most notable are those by Alan Burroughs who made x-rays accompanied by comment sheets for Kress. Burroughs is considered to be one of the earliest scholars to use x-rays as an attribution tool. Also found in this collection are images of works on paper from the Kress’s collection not published in the 1964 -1977 catalogues sponsored by the Kress Foundation. These include twenty drawings by Giovanni Battista Piazzetta donated to the Pierpont Morgan Library and seven prints by Albrecht Dürer formerly in the collection of Mrs. Rush Kress. Other objects formerly in Mrs. Kress’s collection (and many still with the family) are also found in the DLI group. Additionally, the collection includes decorative arts and furniture that adorned the Kress apartment. 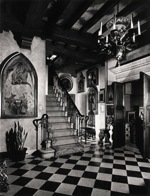 Many are now lost, but can be seen in the 68 images of the Kress apartment (1020 Fifth Ave. New York, NY) previously mounted in the Image Collection’s website (fig. 4). Two hundred and eighty five objects shown in these photographs have been identified and their records linked to the apartment images. These identifications, and the knowledge of when Kress donated them, made it possible to date the apartment photographs within a few years. Fig. 4 Samuel H. Kress apartment, Entrance Hall, 1938/40. In addition to conducting attribution research, cataloguing, and scanning the images, we completely rehoused the Kress Negative Collection. We separated the film and glass negatives, rehoused them in better fitting boxes, and packed the film in Mylar bags for cold storage. These measures will preserve this collection for researchers, who can also consult the collection through the DLI website (http://oculus.nga.gov/R/?func=collections-result&collection_id=1069).